Every piece of furniture, every sheet of linen, every plank of wood and every single stone used in the construction of the Kasbah Du Toubkal was carried up a steep, rough track on the backs of mules or men. As a feat of endurance, imagination and sheer tenacity, the hotel is remarkable and undoubtedly worthy of the awards that have been heaped upon it. From the moment of its inception, the hotel – an innovative partnership between the European continent and the North African Berber community – has contributed to the health, wealth and wellbeing of the local villages of the Imlil Valley and beyond. Opened in 1995, the Kasbah has just recently been named as a charter member of the new network of global sustainable properties as assembled by the National Geographic Society, making it one of only 23 formally recognised National Geographic Unique Lodges of the World. The hotel is owned by Discover Ltd, a UK-based travel company set up by Mike McHugo and his close friend Omar Ait Barmed, a mountain guide from the village of Imlil. The company decided to acquire a derelict building sitting on a rocky outcrop above the village, which was once the summerhouse of a local Caid (feudal baron). Originally built in the 1930s, it was left abandoned in 1956 when Morocco regained its independence from France. Though crumbling, some 60 descendants of the Caid still technically owned the building. After two years of work, however, Discover Ltd was able to take charge of the site, and throughout 1995 Ait Barmed and a team of local men worked to restore the Kasbah, rebuilding it atop its original foundations. 20 years ago this autumn, the Kasbah Du Toubkal (named after the highest mountain in North Africa) first opened its doors to travellers. The Kasbah is not a conventional hotel: a mixture of traditional Berber salons and local crafts, activities, food and hospitality has influenced its interiors. Local traditions and etiquette are maintained by the born-and-bred Berber staff. 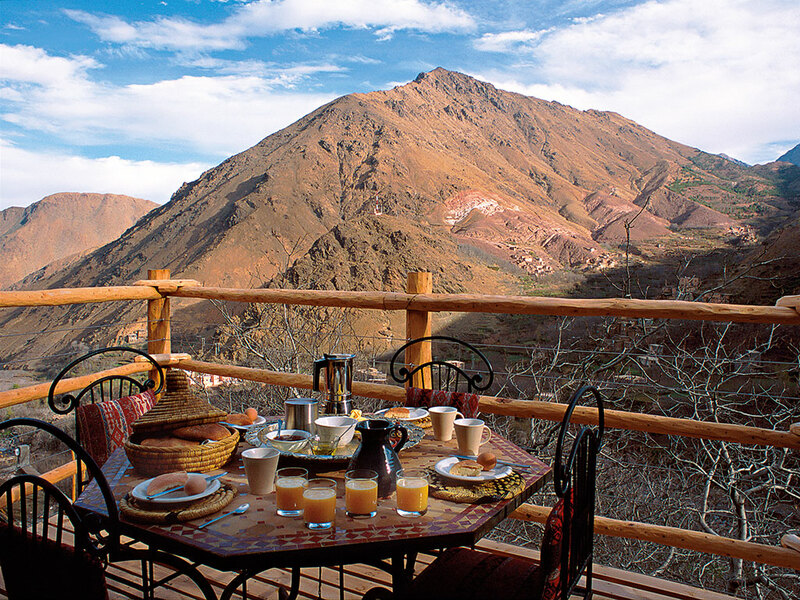 It has become more than just a stopover for the wanderer trekking up the High Atlas Mountains – the hotel is a perfect place for reflection and rest amid the idyllic mountain surroundings. The Kasbah is also unique in its commitment to providing employment for local artisans and other workers: by taxing itself five percent of its revenues, the hotel is able to push additional funds back into local community projects. This primarily covers the work of the Association de Bassins d’Imlil and Education for All projects, the latter of which provides scholarships and safe, suitable boarding houses for girls from the remote High Atlas villages, allowing them to continue their education beyond primary school. Founded in 2007, the first girls from the Education for All project have now left school and some are studying at university – the very first Berber girls from the region to do so. There are now over 140 girls with scholarships living in five boarding houses funded by the project. 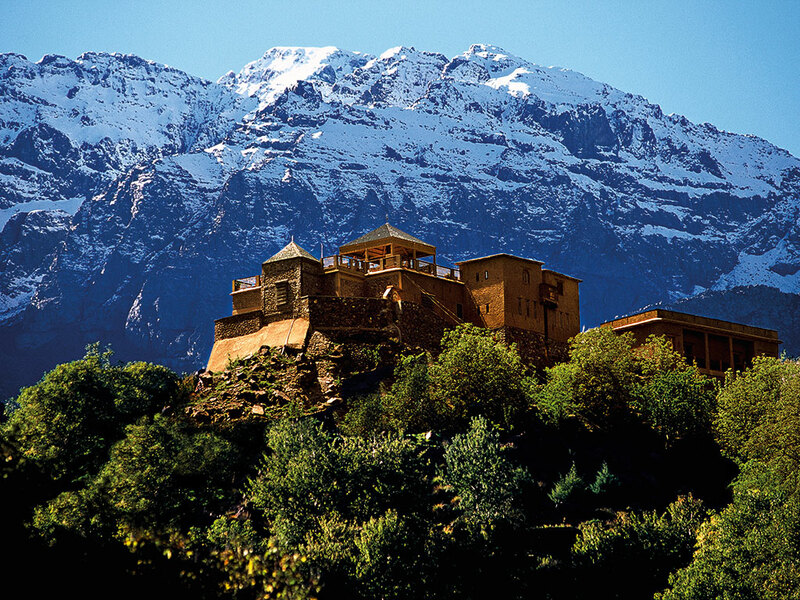 With its focus on innovation and supporting the local community, the Kasbah Du Toubkal continues to be, as stated by Conde Nast Traveller, “the country’s premier mountain resort… with the finest rooftop views in North Africa”. Open all year round, the hotel has 12 en suite rooms, two luxury suites and a separate satellite lodge with four bedrooms. There is also the Grand Salle; an event room that can accommodate up to 60 people. Located only 40 miles from Marrakech, the Kasbah Du Toubkal is an ideal place to relax or escape from the buzz of the city.